Why Are We Called “The Shack”? The Shack has been an Inn for over fifty years. There is a rich history for this 100 acre property along side Robinsons Lake in Jugville, Michigan. Read on…. The Shack property originally housed a shingle mill that was built at Robinson Lake in 1880 by a Mr. E. Francisco. It is believe to have been in operation only one year since it did not show up on the 1881 assessment list. Shingle “Bolts” were still laying around the area into the 1940’s. These “Bolts” were 15″ sections cut off the stumps after the trees had been harvested. Fred Daenzer built a sawmill at Robinson Lake in 1901 which operated for several years. In the early 1920’s, George Graves purchased the property and built a small log cabin which burned down about 1928. He then built a larger one which he called “The Shack”, which burned down in 1937. He began at once to rebuild and completed the structure in 1942. He was a large furniture manufacturer and dealer. He used “The Shack” to entertain business clients and other guests. On the shore opposite of the lake from The Shack the Jugville store came into being named after the small community along the lake. The Marv Deur family purchased “The Shack” Bed & Breakfast in 1976. At that time it had six sleeping rooms and a small dining room.We started taking in guests in 1978 and treated them to a Banana Split at 9 P.M. each night and a breakfast in the morning. In 1989 The Deur’s added a large dining room, 20 more sleeping rooms (6 with hot tubs) and two conference rooms. 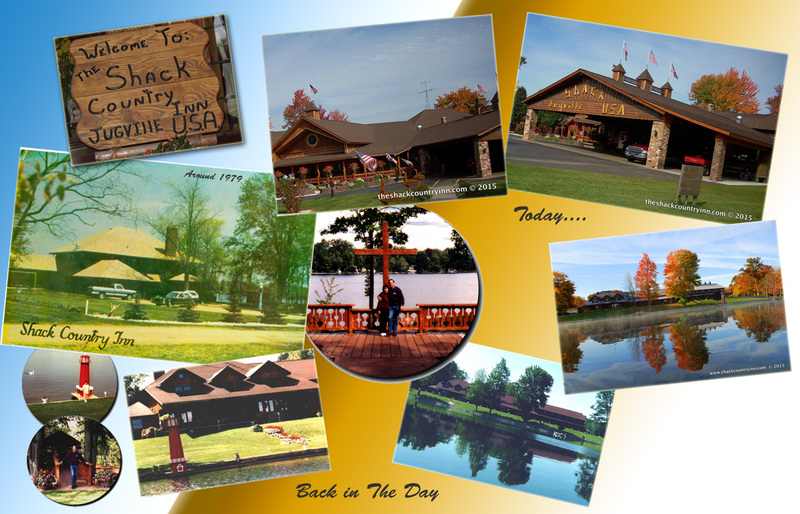 In 1992 we remodeled the original part of the lodge and changed five of the original rooms into Hot Tub Rooms. In 1995 a new building was added called “The Granary” which had eight bautiful rooms with hot tubs and fireplaces in each room. At that time we had a total of 20 rooms of which eleven had hot tubs and eight had hot tubs and fireplaces. In 1996 we added a small outdoor chapel and improved the trails in the woods for the guests to hike or cross country ski. In 2000 we opened a new building we call “The Livery” with 10 authentic log rooms bring out total number of rooms to 44. Each spacious room had a hot tub and a fireplace for a cozy stay. The Livery also had a game room for the guests in The Granary and Livery to enjoy. We also added a covered lakeside lounging area overlooking Robinson Lake for the guest to relax in. In 2014 we had a beautiful expansion to The Livery designed and added 10 more Hot Tub & Fireplace Guest Rooms including some with kitchenettes. We also added a large conference and banquet room with traditional wagon wheel chandeliers that add an elegant yet country ambiance. We expanded the central hallways to include a large game room or meeting room with its own fireplace and comfy sitting area. This is a great place for small meetings or get togethers with family and friends.